Nothing like an impending housewarming party to get our butts in gear to finish up some home decor! In between a cleaning marathon before our guests arrived last Saturday night (more on the food, fun and frivolity in an upcoming post) we took some time out to hang a few items on the walls. For a few months now, most of our framed pieces have been leaning against the walls of the second bedroom. Time to start emptying out that corner! We started by taking advantage of our newly painted green entryway and hung our Chicago signs. We don't have a hallway table just yet, but it will be placed just to the other side of the signs. You might remember these signs and the story behind them from our "Chicago Wall" from our previous place. That was one of the first areas of our old home to come together so the Chicago Wall holds a special place in my heart. 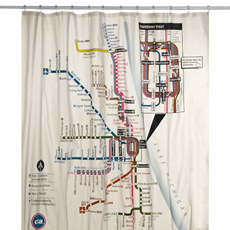 And if you are curious, the Chicago neighborhoods piece now hangs in our second bathroom - it complements our shower curtain: a replica of the CTA map! Bought at Bed Bath and Beyond half ironically, we are starting to like the feel it gives the room! Next up, Bob found a place for his black and white photography he made back in college. These are in simple black IKEA frames. For reference, they hung on the kitchen wall in our old apartment. Our initial idea was to hang them as a similar foursome above the desk in the second bedroom. The black and white really pops against the blue wall. However, Bob had a brilliant idea of hanging them in a row with the fourth (or first, depending on your perception) on the kitty corner wall. Ta Da! I love how these turned out. It reminds me of a filmstrip. That lamp is in its temporary home, it is a bit too tall for the desk, we admit. However, we didn't want the frames too low as we'll likely be getting a monitor for the desk to go along with our impending Mac mini purchase. And by impending, I mean eventual. 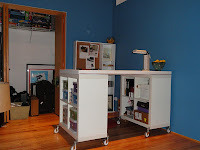 Makes for a nice little work corner in the room! Of course, we can't actually use the desk because the twin beds currently take up every bit of space in the room, but more on that to come! We're thinking Murphy Bed or Sofa Bed or. . . who knows! Also still to come - where we're putting all those darn travel posters we stocked up on when our guest bedroom had a Vintage Travel theme. We are thinking the opposite wall in the second bedroom, but will need to wait until we see how the layout of that room is going to end up to make a final call.